Santa Claus is coming to town…Merry Christmas!! 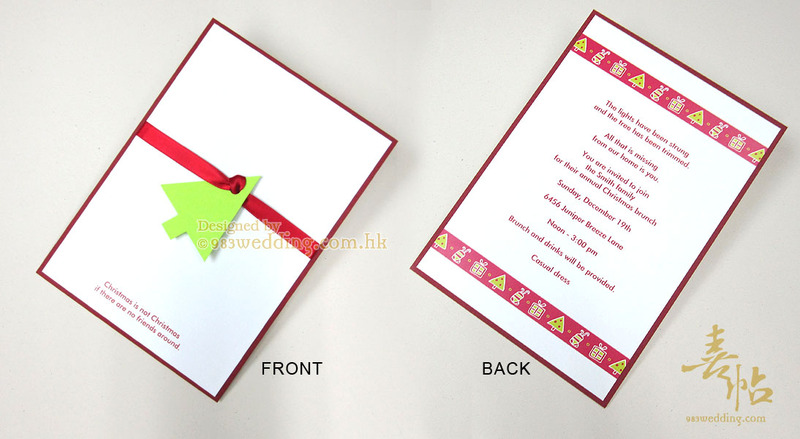 This is our new design Christmas Wedding Card with Christmas tree as the main symbol. You will certainly want to go for this card if you are going to get married exactly on the Christmas day! 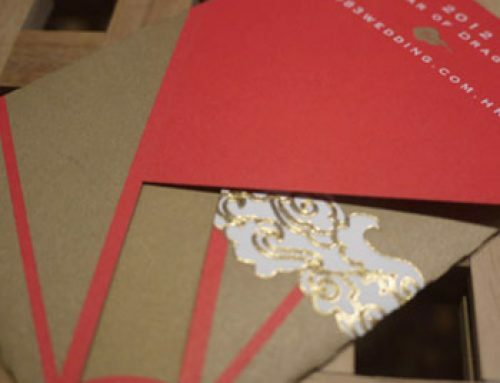 There are certainly various options when it comes to Christmas wedding cards. Usually, you will see elements such as Xmas trees. They will be printed on the card. For this particular design, we do not print the tree. It is just too lazy for us to do so. 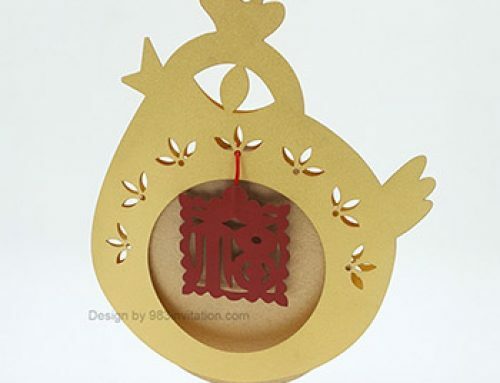 Instead, we make the Christmas tree as an embellishment of the card. The shape of the tree is simple and geometric. You will not find this type geometrical design for Christmas tree unfamiliar. In fact, we do this because we would like to make sure that your guests will know that it is something related to Christmas when they open the envelope and see the invitation. Also, we do not want to make the card too fancy. We would like your guests to have a simple but elegant feeling when they see the design. Without any surprise, the tree will be green in color. You may ask how the tree will be fixed on the card. A red color ribbon is used in this case. It will be used to tie the tree on the card front. Besides the tree, only a few words are printed on the front of this invitation. You can just let us know the words you would like to print on it. However, it will be preferred if these words can be kept brief. Usually, Christmas designs are related to the colors red and green. As a result, we also use these colors in this design. 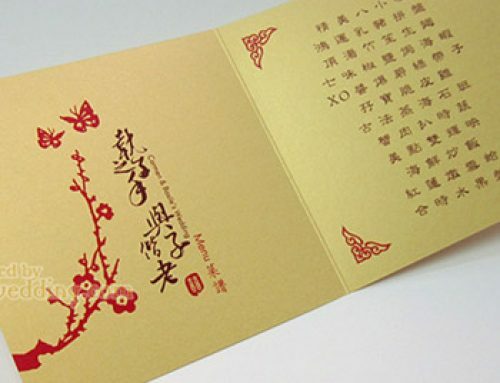 Two pieces of off-white pearlized card are glued on both sides of a deep red color card like a sandwich. The card in the middle is bigger than the two pieces of off-white ones. 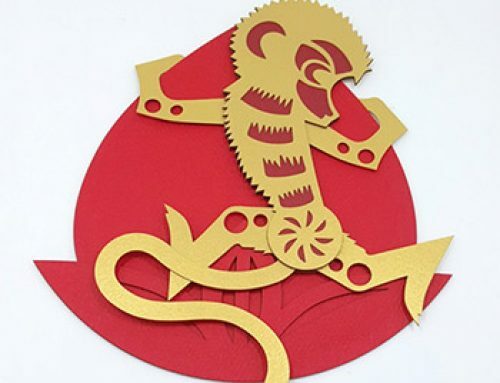 To this end, a deep red color border will be seen on both sides of the greeting cards. 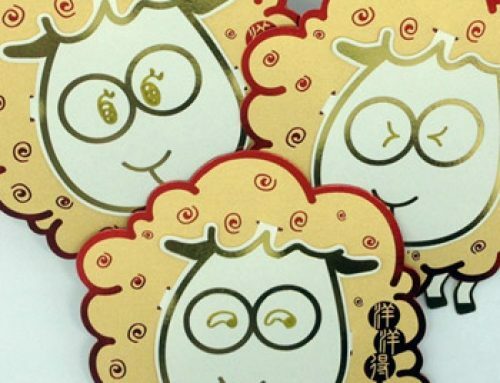 There are a few advantages of this invitation design treatment. First of all, it can help to make the invitation thicker. Brides and grooms usually want a thicker because it will feel better when your guests hold the card in their hands. 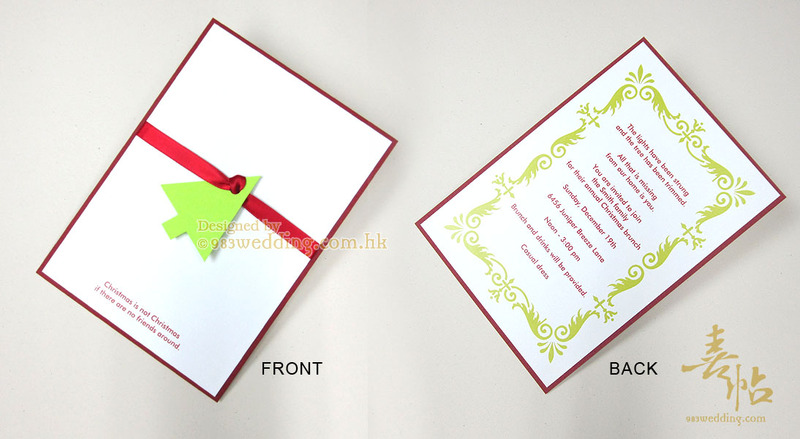 Second, the bigger red color card creates a natural red color border so that the invitation will be more colorful. Your main invitation wording will be printed on the back of the card. As you can see from the images of this wedding invitation design, we have designed different borders for the back of the card (the side with your wording). The one which is red in color looks like a Christmas card more and the one with green border will really look like a wedding invitation. You can choose the one which fit your theme most. For example, if you want to make your wedding a real Christmas party, choosing the one with red color border will be just perfect!